Thanks for purchasing one of our light weight bows. If you have not purchased one yet then feel free to explore the instructions to see if a take down bow would be right for you. 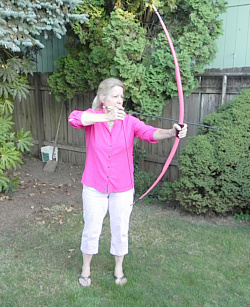 This type of bow is really cool because it is easy to string and shoot. Don't get the idea that a light weight bow is not dangerous. These bows can kill so make sure to be extremely careful This is not a toy. Adult supervision is required..
At this time we have about several different models: The Stinging Turtle, Youth Camo The Delilah and the Babe bows to choose from. Take a look at the store to see which one your like or which model you purchased. A few of these light weight bows are take down bows so you might want to look at the Take Down Bow Instructions. We sell many of these bows and several people have had a few problems with them so we want to provide you with a few instructions. 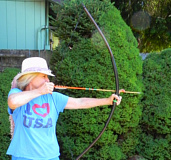 What we have decided to do is provide a little training on putting them together as well as stringing a light weight take down long bow. We have had several people string them backwards and believe me they don't work very well if the sting is not on correctly. We are going to provide these instructions in a pdf format so you can print them if you like. The most important thing to remember is we are only a phone call away. It doesn't matter how simple the question might be we want you to give us a call if you have any problems whatsoever with a take down bow. The only question we can't answer is the one we never receive. Don't hesitate to write or call and we will address the question in a friendly, southern style, down home fashion..
To determine which link you need for your bow just look on the invoice to see if you have a Take Down , Full Length or a Light Bow. After determining which one you have click on the link for instructions and a few videos.